Building health systems against disease burden caused by climate change, improving access of generic medicines for all and intensifying efforts to end tuberculosis (TB) are the major areas of discussion at the 70th Session of Regional Committee for WHO’s South East Asia Region that began here on Wednesday. Also known as the governing body meeting of the World Health Organisation’s South-East Asia Region, the meeting is being attended by 11 member countries, including India, whose delegation is led by Health Secretary C.K. Mishra. Rising sea levels and diseases caused by the climate change in the South East Asian countries are the prime areas of discussion. The summit will also see a Male Declaration at the end of five-day event, which is likely to have the promises reiterated by the member countries to solve the health crisis. “Sustained investment in health is a vital weapon if governments wish to ensure that the hard-won economic progress continues,” WHO Regional Director Poonam Khetrapal Singh said at the inaugural ceremony. “The focus of the meeting is on climate change — on how to build health systems’ resilience to climate change. A well prepared and responsive health system is crucial for preventing and minimising the increasing health risks posed by climate change,” said Khetrapal. WHO Goodwill Ambassador for Hepatitis in South-East Asia Region, Amitabh Bachchan, is expected to join the meeting to advocate urgent action against viral hepatitis, a preventable disease that kills about 410,000 people in the region every year. Strengthening primary health care and health workforce and progress towards universal health coverage are among other priority issues being addressed at the meeting, reflecting the region’s drive to achieve the Sustainable Development Goal (SDG) for health. The event will see ministers and health representatives from the member countries deliberate on accelerating efforts to end tuberculosis as the region bears a disproportionate 45 per cent of the global TB burden. Asked during a media interaction on the sidelines of the event, Khetrapal said that though India is aiming to eliminate TB by 2025 — five years ahead of the targeted time by the WHO — “it is possible only if the health budget by the government is increased”. India’s Health Secretary C.K. 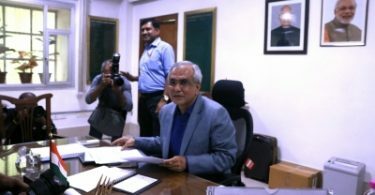 Mishra said that the country was undertaking special initiatives against TB and measles and would soon eliminate those. “There are states such as Punjab which are already prepared to declare itself TB free but we are waiting to eliminate it from the entire country,” Mishra told IANS. Among the other points of discussion at the event are strengthening inter-country cooperation in areas such as medicines procurement and pricing, and regulation of medical products, as well as ways to enhance appropriate use of medicines, especially antibiotics. Vector control will also figure prominently at the governing body meeting, as countries across the region bear a high burden of vector-borne diseases such as dengue, malaria and lymphatic filariasis. The Regional Committee will also review recent progress on priority programmes and discuss next steps to safeguard the health of people throughout WHO South-East Asia Region.